Last year the Food and Drug Administration (FDA) approved a series of nine new warning labels for cigarettes. The labels were designed around a series of graphic images intended to highlight the dangers of smoking – a man exhaling smoke through a hole in his throat, a pair of diseased lungs next to a pair of healthy ones, a mouth covered with cancerous lesions, and so on. The images were surprisingly explicit, and prompted a storm of controversy. The FDA also instituted rules requiring that the labels cover one-half of the front side of all cigarette packages, that the images be rotated regularly, and other similar measures. Not surprisingly, the tobacco companies sued to stop the new rules from going into effect; not long after, a district court judge in Washington ruled that the new regulations were unconstitutional on free-speech grounds. The labels never went into effect, and the people of America continue to be free to buy cigarettes without having to confront images of diseased lips and people blowing smoke through holes in their necks. I had mixed feelings about the proposed labels, but on the whole I’m glad the cigarette companies won this round. I say this with a clear understanding of both the dangers of smoking and the predatory nature of the cigarette industry. Smoking causes a tremendous amount of damage to people’s health, and the use of cigarettes has caused an immense amount of pain and suffering. Moreover, it is difficult to feel much sympathy for the tobacco industry, which has long used duplicitous and downright immoral techniques to sell its products. Warning labels are a reasonable response to the dangers of smoking, and the labels in the U.S. are both small and unobtrusive compared to the labels used in other countries. There is also ample evidence that warning labels with images work better than labels that only use text, that bigger warning labels work better than smaller ones, and that labels on the front of boxes work better than ones on the back or sides. In short, warning labels work and labels with images work better than ones without. In this sense, the FDA’s approach was reasonable and if successful would have almost certainly reduced the mortality associated with smoking. So why am I relieved about how this worked out? Warning labels with images work better than text-only labels because, as one study put it, “they elicit greater emotional engagement with the information [presented], and it is this emotional engagement that drives much of the subsequent quitting related activity.” This makes intuitive sense: images are powerful, and people are more likely to respond to grotesque pictures of diseased teeth and corpses with toe tags than they are to a small box of text on the side of the package written in dry prose. 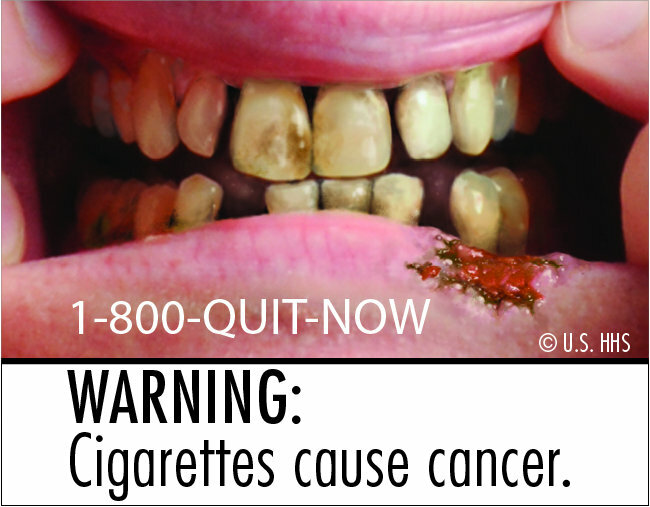 Yet the effectiveness of these images, their ability to “elicit…emotional engagement,” also raises an important question: What do these types of warning labels do to the smokers who don’t stop smoking, despite being repeatedly exposed to the graphic images? Furthermore, what does repeated exposure to these types of images do to people who aren’t smokers at all, but who would nonetheless be exposed to them on a regular basis – people who sell cigarettes in convenience stores, for example, or the family members of smokers, or the random person who sees one of the images on a pack of cigarettes lying on a table in a restaurant. In other words, my question is this: What would it mean to unleash these images into the public consciousness, both to smokers – some of whom would quit as a result, and some of whom would not – and to everyone else? What would it mean to make these gruesome pictures a part of our daily lives? I don’t know the answer to this question, but it’s instructive to consider the long history of such efforts. Temperance reformers, anti-drug activists, public health officials, and others intent on reducing drug use have long suggested that alcohol, tobacco, cocaine, marijuana, and other intoxicating substances cause a variety of ills, including poor health, criminality, sexual deviancy, and so on. They have often framed these dangers in aesthetic terms – drugs supposedly make people not just unhealthy but ugly, not just immoral but disgusting, not just poor but also somehow repulsive. Drug users have long agreed with this assessment. 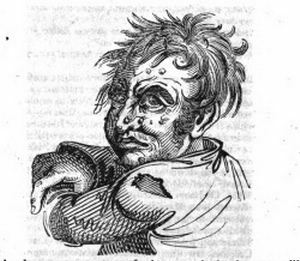 Drunkards, opium smokers, cocaine fiends, cigarette smokers, and others who have habitually consumed various types of drugs have long described themselves as grotesque victims of vile habits. “I have dissipated my wife’s fortune and my own,” wrote one drunkard in 1830. Former friends and acquaintances, he wrote, “turn their faces from me as from a loathsome object[. ]” The sense of self-loathing here is palpable, and it runs through much of autobiographical accounts written by drug users over the next two centuries. “From a well-balanced Christian woman, I became a haggard and wretched physical and mental wreck,” wrote Annie Meyers in her 1902 account of her cocaine habit. She was not alone in these types of feelings. Users described themselves as not only helpless victims of their habits but also as vile and repulsive victims, as tragic figures best shunned by those not afflicted with their curse. From this perspective, the images that the FDA wanted to place on cigarette packages last year told a familiar story. With their depictions of cancerous lips, sickened lungs, and sewed-up corpses, the images would have presented smokers with a picture of themselves as repulsive in nature. The images would have told smokers – and anyone else unlucky enough to have seen them – that smoking is not just dangerous, but that it is downright disgusting. Clearly, the strategy would have reduced smoking to at least some extent. But I think we also need to ask ourselves what the costs of this type of strategy would have been. What would have been the effect of telling people that smoking – and, by extension, smokers themselves – is not just unhealthy but in some sense revolting? There are dangers here that I think we should seriously consider before pushing these types of images into people’s consciousness. One danger is that these types of images might reinforce people’s experiences of their habits as grotesque in nature, and thus reinforce a sense of worthlessness or self-loathing. Further stigmatizing smokers, and furthering the idea that they are somehow repulsive in nature is another potential danger; do we really want the children of smokers to be confronted with such images, and to associate them with their parent’s behavior? Do we really want to be telling smokers that yes, you really are doing something revolting? Do we really want to say to them: Yes, you are revolting. Yes, you should feel disgusted about who you are. I don’t think so. Perhaps it is just me, but I believe that the Hippocratic injunction to do no harm should guide not just physicians but all of us who seeks to improve people’s health. These types of warning labels violate that dictate. They would make at least some people feel worse about themselves rather than better; they would spread fear and self-loathing rather than hope and feelings of self-worth. It seems to me that the government should not be in the business of making people feel worse about themselves than they already do. Life is hard enough without that. Encouraging people to stop smoking, and giving them the tools to do so, strikes me as a compassionate and eminently reasonable thing to do. Scaring people, and placing grotesque images in their heads, does not. Those of us who seek to make the world a better place should not be in the business of spreading ugliness and fear. We are better off without these labels circulating through our minds and hearts. Magnificent post, Joe. And not just because it concerns me! I’m a smoker, so I’m obviously not in favor of having to look at some disgusting picture every time I grab a cigarette (though I guess you could get around it with a metal case), but I agree with your analysis, and I do think it’s a legitimate First Amendment issue. I’ve been rooting for the tobacco companies on this one for a while.